Ideally suited for wastewater streams with varying characteristics, the Krofta Supracell offers higher clarification, thicker sludge consistency and low retention. The circular design helps maximize limited space at plants in a number of industries including food and beverage, pulp and paper, wineries and distilleries, and municipal wastewater. Pioneered decades ago by Milos Krofta, DAF technology is one of the most effective and widely trusted liquid-solid separation solutions for wastewater treatment. 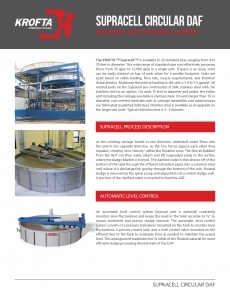 The Krofta Supracell circular clarifier utilizes proprietary DAF technology to float solids to the top of the water surface where it is removed as sludge for easy disposal.